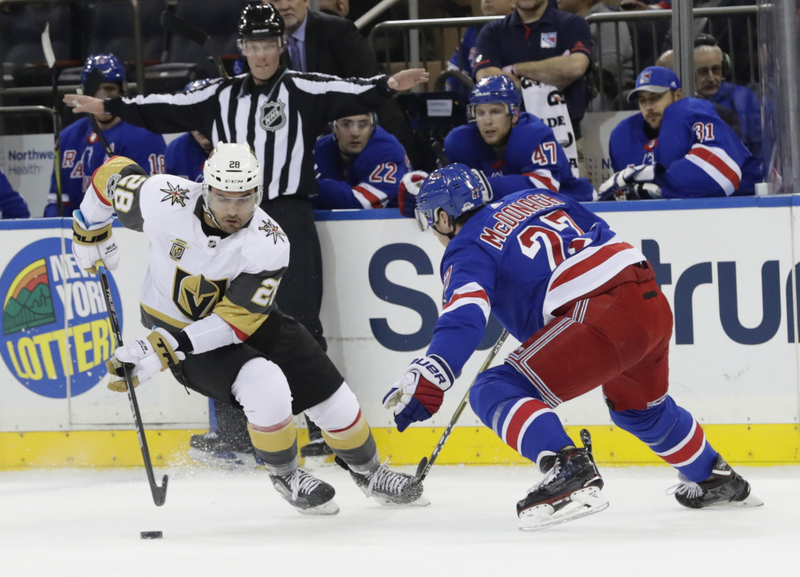 NEW YORK — Mika Zibanejad got the tie-breaking goal with 5:39 left and the New York Rangers scored four in the third period to rally for a 6-4 win over the expansion Vegas Golden Knights on Tuesday night. Reilly Smith scored twice, Oscar Lindberg got a goal against his former team and David Perron converted a penalty shot for Vegas, which has lost consecutive games after winning five straight. Maxime Lagace, the fourth goalie used by the Golden Knights this season, stopped 32 shots in his first NHL start. Kreider pulled the Rangers to 4-3 with a power-play goal as he took a pass from Zibanejad and beat Lagace from the left side for his third at 5:31 of the third. Buchnevich tied it nearly four minutes later, taking a pass from Zibanejad on the left side and putting it into the open net with Lagace out of position after moving forward in the crease. It gave Buchnevich a goal for the third straight game. Grabner added an empty-netter with 1:14 left. RED WINGS 5, COYOTES 3: Anthony Mantha scored his team-leading fifth goal and Dylan Larkin added a goal and an assist as Detroit won at home. The Coyotes scored 11:36 into the second when Jason Demers took a feed from Clayton Keller and his point shot eluded a partially screened Jimmy Howard. But the Red Wings didn’t allow the Coyotes a chance to start feeling good. Mantha made it 3-1 at 13:03, chipping in a pass from Andreas Athanasiou. The Coyotes capitalized early in the third when Nick Cousins lifted a backhand past Howard at the two-minute mark. They pulled within a goal at 16:43 when Keller’s shot was redirected past Howard by Brendan Perlini. Darren Helm scored into an empty at 18:34. JETS 2, WILD 1: Connor Hellebuyck made 28 saves, and Nikolaj Ehlers and Kyle Connor scored as Winnipeg won at St. Paul, Minnesota. Ehlers scored his team-leading seventh goal of the season and Connor added his second for Winnipeg, which is 6-1-1 since an 0-2 start to the season. Rookie Luke Kunin scored his second goal of the season and goaltender Alex Stalock stopped 17 shots for Minnesota, which had won two in a row and three of its previous four games. The Wild were 0 for 5 on the power play.